Pimm's is Britain's number one summer drink but also takes on a great role as a refreshing Pimm's Jelly. A Pimm's jelly recipe is simple that I know, like me, you will be making Pimm's jelly all summer long. Don't feel restricted to just using strawberries in the Pimm's jelly recipe. you can ring the changes with other summer fruits, raspberries work very well. Place the sugar into a small saucepan, add the water and lemon juice, stir. Gently dissolve the sugar over low heat. Once dissolved simmer for a few minutes then remove from the heat. Break the gelatine leaves into small pieces and cover with cold water. Leave to soak for 5 minutes then add to the sugar solution and stir until thoroughly dissolved. Pour the sugar syrup into a bowl, add the Pimm’s and the lemonade. Place the bowl over a bowl of iced water and leave to cool until the jelly is just starting to set – about 30 minutes. If you stir the jelly from time to time, this will speed up the process. As soon as the jelly begins to set add the strawberries and stir, add the mint leaves and stir again. Pour the jelly into large wine glasses, or glass bowls and place in the refrigerator, preferably overnight. Serve with extra strawberries and mint and cream or vanilla ice cream. 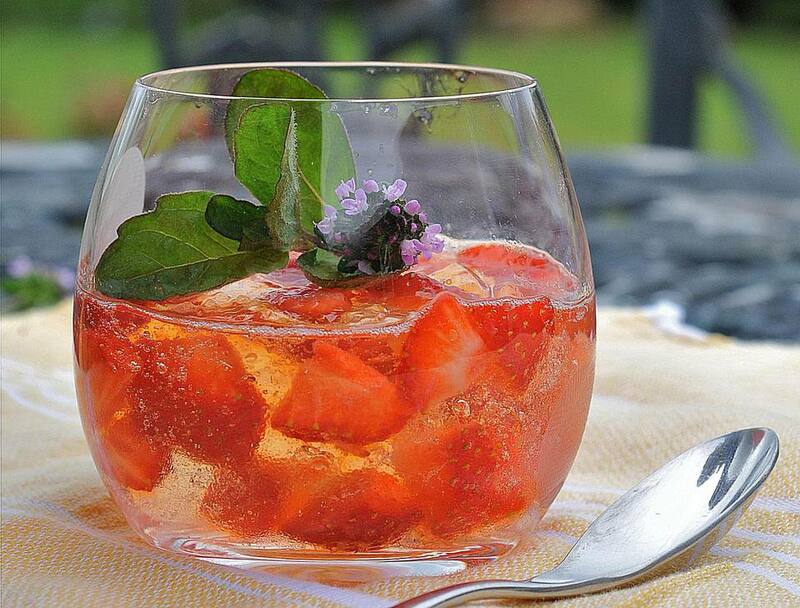 In the beginning, Pimm's No 1 was made using gin, quinine and a secret mixture of herbs as an aid to digestion. However, today this hugely popular summer drink - so popular it is considered second to our favorite cup of tea is made using the classic Pimms No 1 mix which comes in a bottle to which is added the following. Pour one part of the bottles Pimm's No. 1 with three parts fizzy (again bottled) lemonade over the ice. Add plenty of mint leaves, wafer-thin cucumber slices, chunky orange slices, and strawberry. You can use all or just some of these ingredients depending on what you like. I like them all. Make sure you have plenty of all of them as you will no doubt be refilling that jug several times.